Often, when a player is in the midst of a hot streak, I like to examine a rolling average graph of his performances over an extended period. 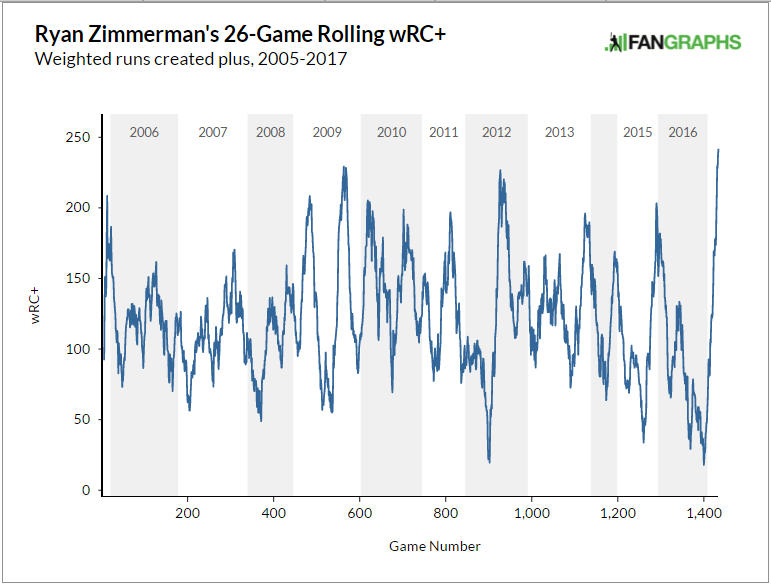 Zimmerman is killing the ball over his last 26 games, but it’s helpful to see if he’s ever done anything like this before. I’m certainly not about to suggest his .448 ISO and .469 BABIP are here to stay, but there’s probably something to be gained from identifying other similarly productive intervals in his career, if they exist. Is this something we’ve never seen him do? Or is this what he looks like when he’s going good? As you can see, this is Zimmerman’s best stretch by a hair. His previous peak was in the summer of 2012, when he posted a 231 wRC+ over 26 games. Maybe you want to count that 2009 peak as well, in which he posted a 224 wRC+. In other words: Zimmerman has done this kind of thing before, at least from a results standpoint. The exact endpoints aren’t that important; the point is, he’s had a couple other stretches where he’s been similarly valuable at the dish. An examination of Zimmerman’s streaks reveals that his strikeout and walk rates were much better in those days. The process for Zimmerman is a bit different this time around. But here’s something that’s perhaps more interesting. In all three of Zimmerman’s best stretches, he’s been a fly-ball hitter, hitting more balls in the air than in his dreadful 2016 or even relative to his career average. While there should be some healthy skepticism about the idea that every player would benefit from hitting more fly balls, it does seem to be the case for Zimmerman. This tracks nicely with what Eno Sarris wrote earlier this week about the idea that every player has their own ideal swing path. Zimmerman has had a great season so far after having a terrible time in 2016. 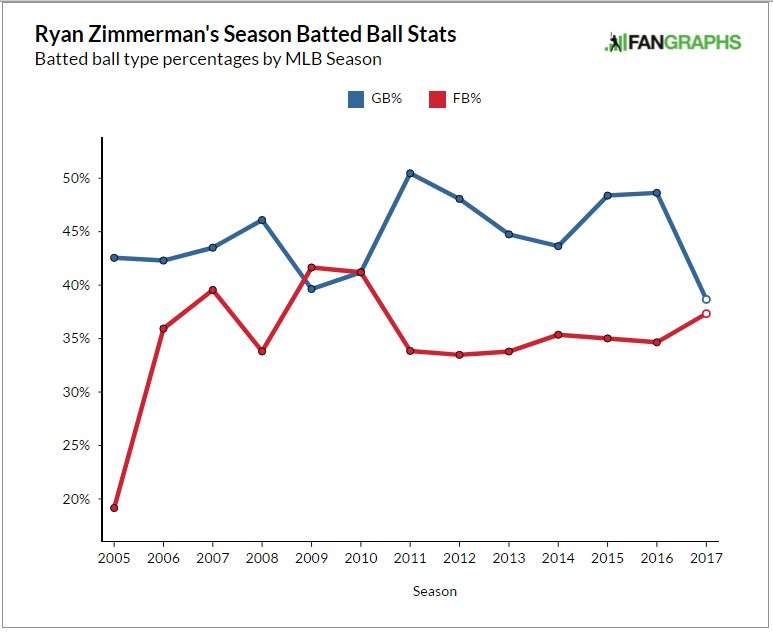 It’s clear that he’s changed the angle at which he’s striking the ball, and while we don’t have Statcast numbers from 2009 and 2012, the more basic batted-ball data seem to indicate that Zimmerman does his best work when he’s hitting about an equal number of fly balls and ground balls. The main takeaway is obviously that Zimmerman’s 2016 was not a sign that his career was over, but you knew that simply from looking at his results this April. You didn’t need a deep dive to know he was crushing the ball. Perhaps a less obvious takeaway, however, is that while BABIP fluctuates and results can be wacky in small samples, players themselves change within and across seasons in ways that aren’t always obvious. Obviously Zimmerman’s .469 BABIP isn’t his new true-talent BABIP, but there’s a version of Zimmerman who hits for power and a version of Zimmerman who doesn’t. It’s not always easy to pick up this variation because there is so much noise piped into everything in baseball, but as Russell Carelton noted last year, true talent can wander. Figuring out whether a player can control that wandering once he has a handle on it is another matter, one that Zimmerman and the Nationals are hoping to answer in the affirmative. We hoped you liked reading The Other Times We Saw This Ryan Zimmerman by Neil Weinberg! ?? ?Get Dollar$ WITHOUT INVESTMENT?? <:: ?? ?